About HF & NFC RFID Wireless Data Loggers - Phase IV Engineering Inc. 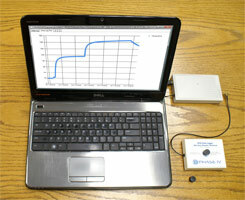 The Micro-T demo video is currently featured on our “About RFID Data Loggers” page – don’t miss it! The world's smallest sealed data logger. RFID interface means no batteries are needed for the wireless communication. Data is wirelessly transferred to an RFID reader that is attached to the computer, so no bulky connectors. No connectors allow the data logger to be very small, making it usable in environments that requires an ultra-small or ultra-thin data logger. Our Micro-T data logger is sealed in FDA approved plastic. Ideal for use in food processing. Withstands high pressure - up to 1200 PSI. Rated to operate up to 1200 PSI. Other custom data loggers can operate up to 10,000 PSI. High temperature - rated up to 145°C (290°F). Most of our data loggers are rated to operate at extremely high temperatures – ideal for food processing. Low density & low thermal mass. Low density & small size allows the data logger to emulate food particles during cooking process. Low thermal mass means the data logger won’t influence the heating & cooling of the object being monitored. High or low sampling intervals. Measure: temperature, pressure, vibration, rotation, acceleration. 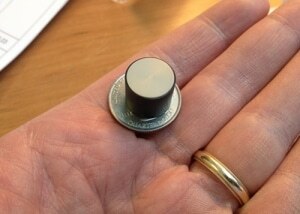 NFC smart phone interface coming soon. Read the Micro-T data logger with Android smart phones using the on-board NFC (Near-Field Communication) reader. Designs that can be customized to your special requirements. If you need a specialized data logger, we can probably adapt an existing design to your needs. The Micro-T utilizes an on-board micro processor with several inputs for sensors and several outputs for LED and other indicators. See the Micro-T Data Sheet for details & specifications. 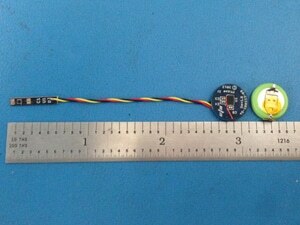 The Micro-T RFID Data Logger is available in our store. Get our Starter Kit for 20% off. Wires are 2.0 inches long. Circuit board: 0.5 inch diameter. 0.093 inch maximum thickness (including components on both sides). Battery: 0.5 inch diameter, 0.125 inch maximum thickness, including welded tabs on battery. Sensor Board: 0.6 inches long, 0.1 inches wide, 0.025 inch board thickness, 0.045 inch total thickness at the temperature sensor. Wire bundle: 0.040 inch diameter bundle thickness.